benevolence, brotherly love, charity, companionability, companionship, compatibility, comradery, concord, fellowship, friendliness. 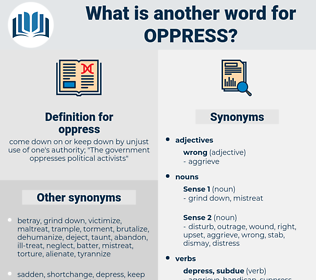 What is another word for oppress? come down on or keep down by unjust use of one's authority; " The government oppresses political activists"
repress, stifle, quell, crush, pressure. calm, give in, help, let go, comfort, benefit, delight, gladden, compliment, soothe, praise, aid, assist, boost, yield, make happy, please, inspirit, leave alone, surrender, release, encourage. buoy, excite, console, invigorate, solace, uplift, cheer, animate, reassure, inspire, brighten, lift, hearten, lighten, stimulate, rejoice, enliven, gratify, assure. The associated peoples desire and deem it their duty similarly to assist in relieving the people of Russia from the misery, famine, and disease which oppress them. To what end should he, on the one side, engage to assist Cesare with 300 lances to " oppress" the Orsini - if necessary, and among others - whilst, on the other, he goes to Orsini with the story which they attribute to him?